Prime Minister Theresa May and European Commission President Jean-Claude Juncker begin a joint press conference following talks in Strasbourg. DUP Westminster Leader Nigel Dodds says MPs are speaking tonight "without having sight of the precise text". When the text is published, "we will need to analyse that very carefully," he says. Labour MP and chair of the Brexit committee Hilary Benn says a suspension "of our obligations to the backstop" can only happen after the arbitration panel has made a ruling. He suggests that if the panel had questions they would have to be referred to the Court of Justice of the European Union. That would mean a ruling by the court would be binding on the UK, says Mr Benn. David Lidington disagrees. He says the withdrawal agreement is not part of European law. "It has the status of treaties under international law, not European law," he adds. SNP Europe spokesman Peter Grant says "the mood of Parliament and the four nations is that this deal cannot go through." He says the only option is to give Parliament and the people a choice between "this Brexit and no Brexit". Conservative Iain Duncan Smith says the meaningful vote should be pushed back to allow MPs the chance to question the attorney general on the changes. "It is her [the prime minister's] clear intention to stick to the timetable she has announced," replies David Lidington. David Lidington rejects Keir Starmer's assertion that, because the text of the withdrawal agreement has stayed the same, nothing has changed. He says the withdrawal agreement and the joint instrument have to be read alongside each other. "They have equal force," he says. The whole cabinet is supporting these "improvements" he adds. Sir Keir Starmer says tonight's statement is "not going to take anyone very far". He suggests that MPs will be asked to vote on the withdrawal agreement, without any changes. Shadow Brexit secretary Sir Keir Starmer now responds. He notes that the minister didn't say that the words of the withdrawal agreement are actually being changed. "It doesn't sound likely that is going to happen," he says. Mr Lidington tells MPs that the government will tonight table the motion that the House will debate tomorrow. He says MPs face a choice: "Vote for an improved deal or plunge this country into a political crisis". Mr Lidington says he can provide an update on what has been agreed so far. He says legally binding changes that strengthen and improve the withdrawal agreement have been secured. "Tonight we will be laying two new documents to the House - a joint legally binding instrument on the withdrawal agreement and a joint statement to supplement the political declaration," he says. He says the documents provide "confirmation that the EU cannot trap the UK in the backstop indefinitely." Cabinet Office minister David Lidington gets to his feet to begin the statement. He apologises to MPs that he has not been able to give them advance copies of his statement. This is because negotiations are still taking place, he says. Meanwhile, in the Commons, Justice Minister Lucy Frazer is wrapping up the debate on the Children Act (amendment) Bill. It is then the last chance for any other statements to be made before the adjournment. 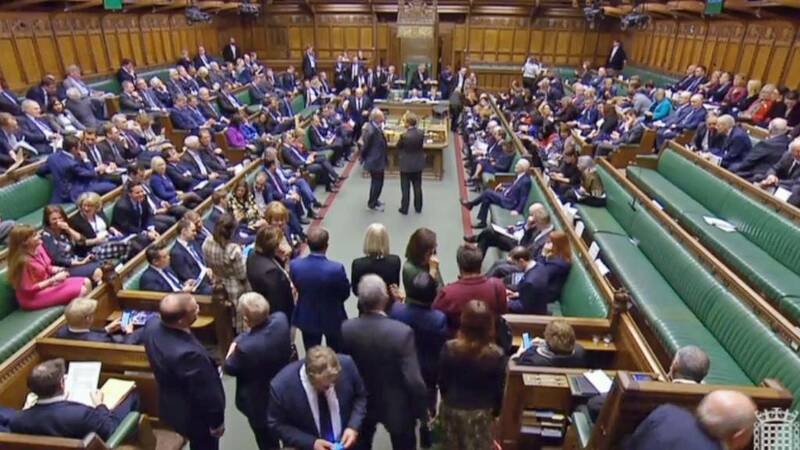 MPs are waiting for a government statement on Brexit and the publication of the motion which MPs will be voting on tomorrow. The BBC's Adam Fleming says a press conference is neither confirmed not imminent.